In addition to keeping this blog, I also post my restaurant reviews on Yelp.com (note the pretty new map to your right!). I got so excited tonight when my phone went off and it was an E-mail from Yelp telling me that I had received a message from another user. I started thinking maybe some magazine editor read my reviews and wants to offer me an internship, or at the very least someone is taking the time to comment on my posts. But no, instead I log in and see that it’s a message from a guy (using a photo of TI as his profile picture might I add) just trying to pick me up. I was so disappointed. I mean doesn’t he know that there are online dating sites for that type of thing? Newsflash…Yelp isn’t one of them. 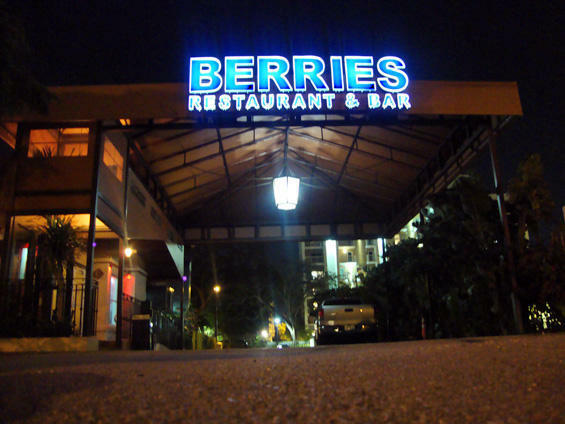 So now I am in a bad mood and feel that this would be an appropriate time for me to give my first 1 star review (and no, this isn’t just me taking out my anger on the restaurant…the restaurant, Berries, is actually terrible). When you first get to Berries in the Grove you will be fooled (as I was) by the seemingly good menu, which offers a wide variety of healthy salads and sandwiches, in addition to homemade pastas. The problem is that they have confused healthy food with flavorless food. Nothing at this restaurant is seasoned—no herbs, no pepper, no salt, no flavor! I ordered the Berries House Salad, which has mixed greens with grilled chicken breast, tomatoes, avocado, portabello mushrooms, and manchego cheese all tossed in a homemade balsamic vinaigrette. This salad has all of my favorite ingredients, but somehow I found myself having to force each bland forkful into my mouth. The chicken was not seasoned with salt or pepper or garlic, and so it had zero flavor. The three paper-thin slivers of manchego cheese went undetected in the huge salad (shouldn’t even be listed as an ingredient in my opinion). Even the dressing was somehow bland. It tasted like olive oil with the faintest hint of balsamic vinegar. A good robust balsamic should have Dijon mustard, garlic, oregano, and a little honey. My boyfriend’s Chicken Club Sandwich was no better either. I mean swiss cheese and bacon are two of the most flavorful ingredients I can think of (other than garlic, of course) but somehow even their flavors went unnoticed in his sandwich. Worst of all, there were a couple areas in his chicken that looked pinkish and inedible. So he just ate his fries, which of course had no salt, and left his sandwich on the plate. Now let me state that I’m not at all a person who over seasons their food (in fact, I hardly ever pick up a salt or pepper shaker at restaurant), but I do believe that herbs and spices should be used to enhance and bring out the natural flavors of vegetables and meats. There are occasions when the flavors of a raw vegetable are so delicate and fresh that they don’t require any additional ingredients (such as a just picked ripe tomato, or crunchy firm asparagus) but the produce served at Berries is not fresh and is tasteless. Don’t bother going to Berries, I honestly think that plain tofu may have more flavor than their food (it only receives 1 star because I don’t know how to make a half of a star).